Competition litigation has become a major area of practice and almost invariably involves more than one, and often several jurisdictions. Moreover, arbitration and other dispute resolution mechanisms alternative to litigation (ADR) are becoming increasingly important in competition law. This book examines all the relevant aspects of litigation, arbitration and ADR in a number of jurisdictions around the world to provide a thorough and exhaustive guide for practitioners based on the analysis of the policies and principles that underpin the law. The authors and editors are leading practitioners, academics and competition officials in their own jurisdictions and world-wide and bring together unrivalled expertise and practical insights which will be useful in planning and managing multi-jurisdictional competition disputes. Austria Thomas Eilmansberger & Anita Lukaschek. Croatia Boris Babić, Davor Babić & Boris Andrejaš. Czech Republic Jiří Kindl & Michal Petr. England and Wales Gordon Blanke, Renato Nazzini, Ali Nikpay & Vincent Smith. France Louis Vogel & Joseph Vogel. Germany Friedrich Wenzel Bulst, Katharina Hilbig, Thorsten Mäger, Thomas Paul & Tim Reher. Peru Carolina de Trazegnies, Alejandro Falla & Alfredo Bullard. Scotland Catriona Munro & Jennifer Marshall. Spain Luis Ortiz Blanco, Carlos de los Santos Lago,Jaime L. Iglesias & Konstantin Jörgens. United States of America. Daniel Brown & Eric O’Connor. "This book serves as a comprehensive guide to competition litigation, arbitration and ADR around the world." "The authors and the editors have been selected amongst the leading practitioners, academics and competition officials in their respective jurisdictions as well as around the world. Their qualities bring together unmatched expertise and practical insights, which the reader will find useful when challenged with planning and managing a multi-jurisdictional competition dispute. The added value of this writing is not only a general insight into the various legal systems of competition law litigation around the world, but also its focus on the analysis of the policies as well as of principles behind the respective laws and legislative regulation." "Having seen and read the headlines, I sincerely believe that it is a book one must aspire to have and read. Competition law is a vast area in law with an uplifting motivation in the goals which set up the laws that govern competition law in the various states. The authors have done well to appraise the said topic from a multi-jurisdictional angle. I wish every reader of this book a happy reading." Yours Faithfully, Chineze Obianyo. "The book examines the most relevant aspects of litigation, arbitration and ADR in selected jurisdictions around the world. It provides practitioners with a thorough guide based on the analysis of the policies and principles that underpin the läw." "On average , every country chapter expands over some 60 pages which clearly shows the depth and width of the various contributions. And indeed, the Handbook provides much more than just a broad overview in respect of the competition litigation reality in the various jurisdictions." 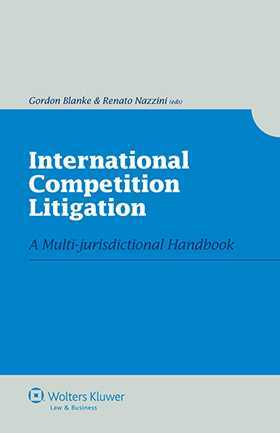 "The Handbook provides its reader with a quick — but at the same time broad and thorough — overview of the legal reality in respect of competition litigation in the various jurisdictions. It is probably one of the best instruments available for professional forum shopping and can be strongly recommended to all practitioners active in this field."